On the 8th of August most of the snow on Barnes Ice Cap has melted apart from the very top. This reveals an interesting pattern of white parallel lines flowing down the ice cap. Most of these are dried out meltwater streams. Only a few are light blue and have meltwater flowing down. The pattern reminds me of a skeleton from a prehistoric animal buried in sand or rock. Thanks for starting this thread Tealight. I'm particularly interested in the Barnes and the Penney Ice Cap because they are the last vestiges of the great Laurentide ice sheet from the last glacial maximum. What I'm wondering is how much more warming, if any it would take to render these ice caps extinct. Judging from the satellite images, the entire Barnes ice cap seems to have experienced some melt this summer with the possible exception of the area at the highest elevation. Your images were very helpful as I'm not very good in that department. By the way, isn't that the fossil of a trilobite? Yeah both ice caps are worth to keep an eye on. I added Penney Ice Cap to the subject line since they have many similarities. I tried to estimate surface retreat of the Barnes Ice Cap, but failed to find any significant changes. Earlier images have only 15m or 30m resolution and don't line up exactly with the new Sentinel 2 images. A 10-15m retreat would only be one pixel difference which is far less than the accuracy of my image manipulation and overlaying skills. I'm not an expert on fossils, but it looks like other trilobite from wikipedia. All I did was search fossil on Google image search and selected one that looks quite similar. Maybe there are other skeletons that meet the pattern. Please click to animate and enlarge! Espen: I can get the image to enlarge, but it wont animate. Thanks Espen. For some reason, I was expecting the retreat to be a bit more dramatic. I wonder how much mass was lost in that 41 year period? Report on a study on the Barnes icecap by Gifford Miller at UColorado Boulder. Photos. "Global warming is causing significant melting throughout the region and will claim the last remnants of a massive ice sheet that once covered all of North America and that remained stable for 2,000 years, according to findings published yesterday in Geophysical Research Letters, a journal of the American Geophysical Union. The Barnes Ice Cap, which is about the size of Delaware and is located on Baffin Island in the Canadian Arctic, is likely to disappear even if humanity curtails its combustion of fossil fuels at levels not currently expected, even under the most conservative estimations. "And while the ice cap's disappearance may only cause sea levels to rise a few millimeters, its loss symbolizes a more dire threat of warming to the region, said Gifford Miller, a glacial geologist at the University of Colorado, Boulder, and co-author of the study. It shows large portions of the Greenland ice sheet are also at risk of disappearing, which would raise sea levels across the globe." Thanks to ColoradoBob for the link. I read about this on Climate Central today. Thanks Cate and Neven. Judging by the size of the accumulation zone, it would appear that the Barnes Ice Cap is in danger of extinction. Something new to me... From the article posted by Cate. Particularly alarming, Miller said, is that the ice cap continues to melt even when the summer sun is at its weakest, something scientists did not expect to find. For the record, there is some intermittent discussion of the Barnes Ice Cap on the Arctic sea ice changes: Natural variation vs human influence thread starting with Reply #182. This year melting on Barnes Ice Cap occurs all the way to the top. Some blue meltwater channels actually connect over the top, which looks very unusual (at least to me). The average width of a channel is 50m and the distance between them is 500m. Like in last years image all channels are very uniform, in parallel at the top and combine towards the bottom. From that first image, they don't appear to run all the way to the edge of the ice. Are these diving through moulins to the base of the ice cap and, as basal flow, filling the melt lakes at the edges of the cap? Click on image to see gif that shows how the cap has shrunk since 1975. Arctic temperatures are increasing faster than the Northern Hemisphere average due to strong positive feedbacks unique to polar regions. However, the degree to which recent Arctic warming is unprecedented remains debated. Ages of entombed plants in growth position preserved by now receding ice caps in Arctic Canada help to address this issue by placing recent conditions in a multi-millennial context. 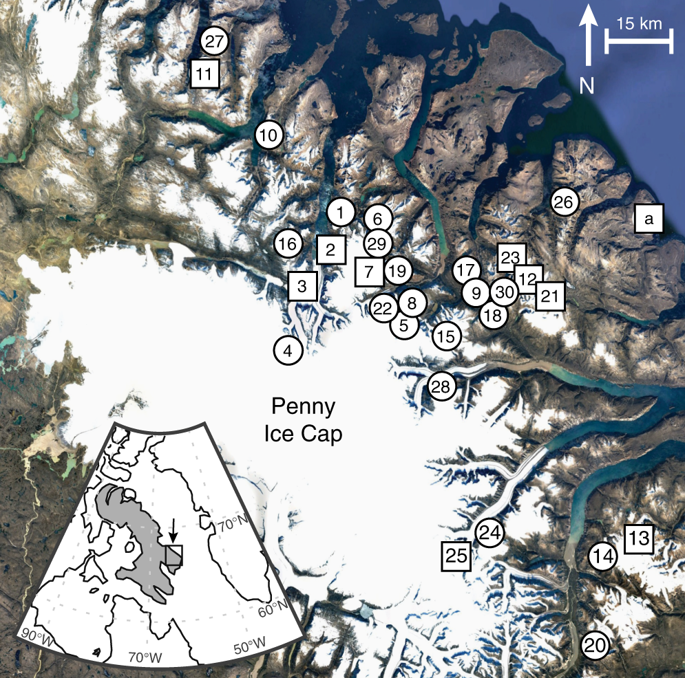 Here we show that pre-Holocene radiocarbon dates on plants collected at the margins of 30 ice caps in Arctic Canada suggest those locations were continuously ice covered for > 40 kyr, but are now ice-free. We use in situ 14C inventories in rocks from nine locations to explore the possibility of brief exposure during the warm early Holocene. Modeling the evolution of in situ 14C confirms that Holocene exposure is unlikely at all but one of the sites. Viewed in the context of temperature records from Greenland ice cores, our results suggest that summer warmth of the past century exceeds now any century in ~115,000 years.